Yes, I know it’s crazy old, totally useless, but it did mostly compile. Unlike Serweb 0.3, Apache is HTTP 1.1 compliant, which means that I can put it behind haproxy, and enjoy the fact it doesn’t need a dedicated IP address. I had to pull out some stuff, like some of the service features, so it really only runs as a console app. I’ve compiled it with /Zi meaning full debug and no optimization. If you want to re-compile you’ll probably want either the Win32 SDK, or Visual C++ 1.0 32bit, and replace the headers and libraries from the Windows NT 3.5 SDK. Much like trying to build GCC 2.6.3 on Windows NT. 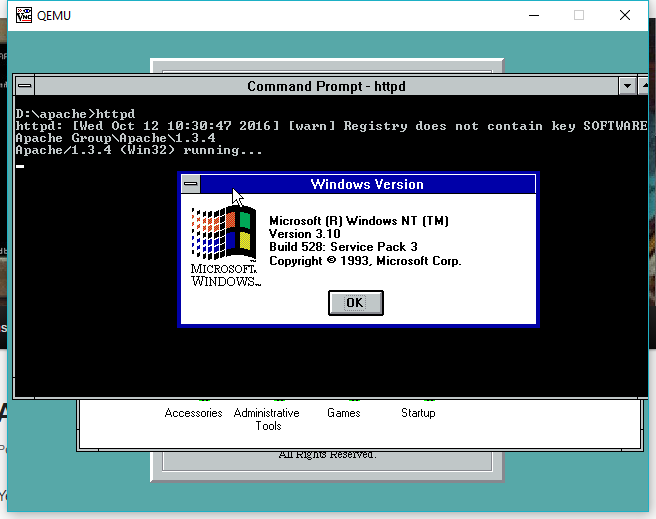 Also in a silly way, thanks to Qemu, I’m now running both OS/2 & Windows NT on the same server, running Linux. While somewhat “useless” in a contemporary sense, I’ve certainly had some strange projects (often equally as useless) that I remembered you had done something with (though they currently escape me – I really should write them down like you!). Ensuring that these legacy things aren’t forgotten and taking some of the bitrot from them is a great service and I for one don’t tire of them! What makes it more so useless is that I really don’t have anything to serve… I mean in this day & age all I really have is this blog, and some old abandonded crap.. It’s just static pages. It’s not like I need another VM with another OS, running yet another web server to serve some static page ‘just because’ ….. but here we are! From my long abandonded front page thing, to various old dead sites I’ve “collected”… This blog is the only living thing. I guess that is OK, and I guess at some point someone will collect me…! This is very cool. I never really did delve into Windows ‘NT’ below 2000. This whole idea makes it worth the while! 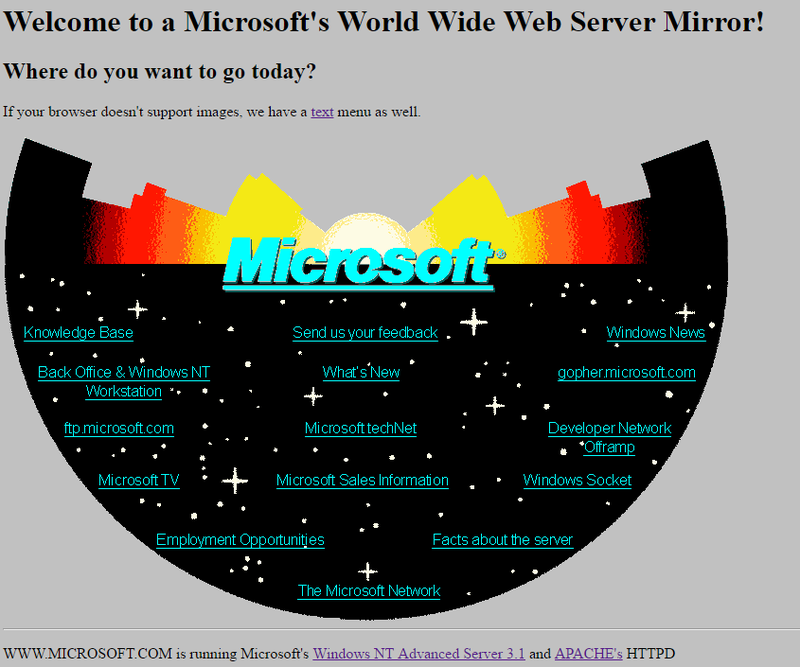 The old actual Microsoft page is here, https://www.microsoft.com/en-us/discover/1994/. There is also a whole slew of ‘archive’ pages from before 2000, https://www.microsoft.com/misc/features/features_archive.htm . Excellent stuff. I have a laptop with NT3.51 and still regularly use NT4 for testing software I write in C/C++, a lot of which is thoroughly pointless but fun to write nevertheless (a Tcl interpreter and a small mail server plus dozens of utils for sysop use at work). I used to dabble a lot with Apache and my own webserver ran Win2k until I couldn’t afford the broadband about 4 years ago. No problems with it whatsoever. It ran extremely well 24/7. I really must get a website back online sometime! Sounds very interesting stuff! If you want a plug for your stuff, just say it! As you can see I love the old stuff, especially re-hashing it new again! All the cool kids use github, but I like the binary releases on sourceforge, and it’s been around far longer than any of these flash in the pan things, so there may always be people interested. Have considered Git and other VCS but I never got around to figuring how to use VCS even though I look after a team of programmers using Mercurial and an Hg server. It all seems far too “faffy” for me for my small projects. Simple regular ZIPs and diffs when nesc work just fine and I have a harder time catastrophically screwing up revision history as I did when I was testing Hg and SVN! Previous Previous post: Just got a Roland Soundcanvas SC-88!